Adelaide Botanic Park, Sun 13 Mar. I made my way back to WOMADelaide just in time to catch the second half of Sarah Blasko’s late afternoon set. Though I’d heard great things, I hadn’t familiarised myself yet, so it was wonderful to discover her in person and confirm that she is every bit as compelling as her reputation had implied. Today her voice was simply perfect, to the point where I had to wonder if she was having a good day, or if she always sounds like that. She turned in a playfully-rocking No Turning Back before committing to the slow burn of Luxurious. Then it was off to the upbeat early cut Always Worth It. Her band provided solid accompaniment and the audience showed its appreciation as the set closed with the drum-heavy I Awake. Wow. The Israeli-born Ethiopian soulstress Ester Rada put on a spectacular show for the evening crowd. Her songs and vocals were all great, but the real secret weapon was her outrageously talented backing band, each of whom was featured for extended solos which, far from bringing the action to a halt, actually proved to be highlights of the set. Suffice to say that her saxophonist/flutist, trombonist, drummer, keyboardist, and bassist all proved their mettle as extraordinary instrumentalists while bringing life to tracks like Life Happens, Could It Be, and I’ve Been Away. She entreated us all to jump as they do in Ethiopia for closer Nanu Ney and we couldn’t resist, having been totally won over. I’d long heard legend of Calexico’s live prowess. Excited to see it myself up close, I was not disappointed. Musically flawless, their Tex-Mex blend of Americana and Latin music was a joy, cinematic and danceable, burning so many moments into memory as the sun crossed the horizon. From recent tracks like the straightforward Falling From The Sky and the atmospheric World Undone, to older material like Crystal Frontier and Minas De Cobre, Calexico made excellence look easy while seeming to have a great time in the process. Guitarist Paul Niehaus was particularly impressive, turning in fantastic wah work on Inspiracion while dropping jaws with solos and livening up the evening with pedal steel. Closing with a sing-along to Güero Canelo, Calexico triumphantly converted the uninitiated, myself included, and the WOMADelaide audience was ultimately thwarted in their emphatic demand for an encore. I tried to take it easy today and get around a bit more, which led me to check out snippets of a number of acts. I caught the last minute or so of Mountain Mocha Kilimanjaro’s Stage 3 set, selling me instantly on their performance tomorrow (stay tuned), before catching the beginning of flamenco singer Diego El Cigala’s evening Foundation Stage performance, which was relaxed and soulful, with the audience shuffling gently to his traditional Cuban rhythms. Later on, I danced to a bit of St. Germain’s Foundation Stage set. The French house producer’s recent return after over a decade away from releasing music comes with a live band to bring life to the loops that fuelled the music originally, and similarly to the previous night’s headliner, De La Soul, this experiment in live reproduction of sampled music appeared to me largely successful. When I closed my eyes, I heard house music, which was pretty cool, considering that there was an eight-piece band working with mechanical precision to bring about the trance effect. I wandered through the Global Village in search of new thongs, as my sandals are old and I can feel everything through them as they grow thinner and thinner. I was not successful in my footwear quest, but I did find my way to the Zoo Stage to catch a few songs from Chinese acoustic grunge duo, Tulegur. My fellow reviewer from The Clothesline, David Robinson, made note of their set yesterday, and I was spellbound as they constructed a widescreen soundtrack to the movie in my mind. As I sat, exhausted and soon to depart, I briefly transcended worldly concerns along with the sizable crowd that had gathered, and the spectacle and trappings of a major music festival retreated from view, leaving only magic and wonder. Later, as I marched up Frome Road to catch the last bus home, I thought to myself that only at WOMADelaide could an act with 774 Facebook likes and songs that were largely expansive instrumentals with wordless vocals travel from China to captivate an awestruck audience. 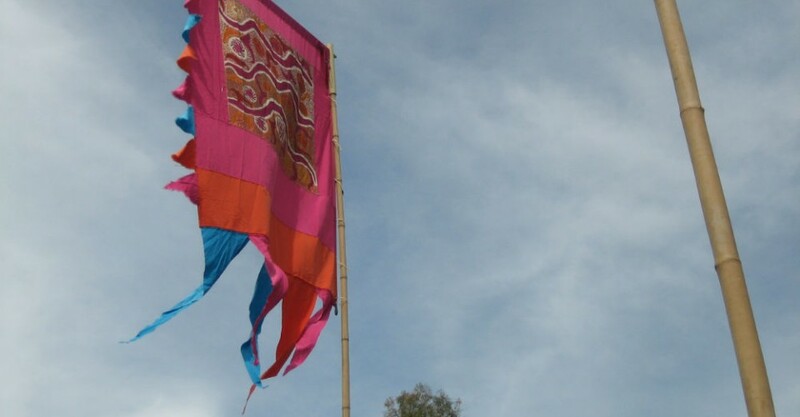 At a time when so many music festivals struggle and fail to reach a viable audience, there must be some kind of moral to the story of WOMADelaide’s eclecticism and embrace of the world’s performing arts in all of their complex and disparate glory.